PR, Clive Thompsons-of-the-world, is far higher up the rungs of leadership than you perceive it to be. It is more about relationships than publicity, and more about leadership than relationships. We PR folks get our priorities mixed up sometimes; but some of us are changing things.And CEOs, this is not the time to “fire your publicists, go off message and let your employees blab and blog”. Even more than ever, you need the counsel of true PR professionals who understand that our chief mandate should not be “to create publicity”. We build the vital, trusted relationships that your companies depend on, and not the illusion of it. “PR” is not a job title or “marketing strategy”. It is organisational leadership made public and personal. And today, we have the tools to do this better than ever. I think Melvin has hit the nail on the head. It’s up to everyone involved in communications to make sure that the role and value of what we do is understood and appreciated. Now more than ever there is a need and an opportunity for good work to be done. I’ll be honest – when I looked at the list of companies that were going to demo at last nights WebInno event, I was pretty underwhelmed. There was Virtual Ubiquity, and online word processor; MyDesignIn, a remodeling planning tool; and Cardvio, an online greeting card company. I’d gone to each of their sites before the event and was not expecting much. One thing that did strike me right off the bat was how much this event has grown over a pretty short time. I attended my first back in July and there were maybe a hundred some odd people (which really impressed me at the time). This time, the event was being held in one of the hotel ballrooms because more than 300 people had registered. By the time the demos started it was standing room only – very cool. Before the formal session I caught up with the guys from SpotStory to tell them how much I was enjoying the site and with Dave Evans. On to the demos . . . Virtual Ubiquity went first. Their demo was like magic. They have a WYSIWYG word processor built in Flash that looked absolutely awesome. They also promised that it would be support Apollo to provide online and offline capabilities. Several features of the applications – its formatting and comment tools – got spontaneous applause from the audience. The only think that wasn’t discussed was how the thing was going to actually make money. A small detail, perhaps, but one not to be ignored . . .
Next up was mydesignin. This is a Flash-based home remodeling tool. When I’d gone to the Web site I didn’t think much of the idea, I just didn’t get it. When they began to show it off though, I got it – and I think everyone else in the room did too. They provide really simple tools for accurately creating a sketch of a space and then populating that space with the real details of real products. They currently are able to scrape the relevant data from any Web site – so if you’re looking for a sink, you can get all you need by visiting a manufacturers site, selecting a model and the applications collects the data it needs to add the item to the design. One of the cool things is that the site maintains a persistent dataset of all of the items users select so that over time more and more items are available without needing to seek them out online. They have plans to work with manufacturers to sell premium product placements on the screens of consumers working on specific kinds of products. I can imagine that being of some interest. . . The final piece of the puzzle is the ability to collaborate. He wasn’t able to demo this but did discuss a couple of ways it would work. One is that people could find the designs of others who had worked on similar projects in the past – the same shape kitchen, the same appliance outlet layout, etc. Another is that contractors could use it to help homeowners develop their ideas more quickly and accurately. In either case, I could see where there might be some benefit. The last presenter was Cardvio. When I’d seen their name I assumed it was going to be some kind of heart thing. Nope. It’s greeting cards. Now I’ll be honest, I can’t remember the last time I sent a card – but maybe that’s the idea of Cardvio: make it easy. Also built on Flash, Cardvio allows people to create and send custom cards through the mail. You can add photos and images (your own or from a collection offered by the company), your own text and mail them to one or 1,000 people. They also have a fund raising element to the site which allows you to send cause-related cards to benefit specific groups. They’ve also had the ability to send cards added to the homepages of a number of non-profit organizations. It’s a nice idea I guess but it didn’t really do much for me. Talking with people after the demos it seemed that people were most impressed by mydesignin, followed by Virtual Ubiquity and then Cardvio. I was talking with Matt Gross, of Ulocate, afterward and he pointed out that perhaps the most interesting this was that all of the companies were built on Flash. A good point. I didn’t see all of the side dish companies – only Povo – a block-level, location-based, wiki-driven community site – and thenextbigwriter – a community site for aspiring writers. I loved the spirit behind thenextbigwriter and the execution of Povo. I had a chance to hang out with Dave Evans and Dave Cutler (which resulted in some ideas that need a post of their own when I have a chance) and Rod Begbie as well. All in all it was a good night and I’m looking forward to the next one in May. You can find Dave Evan’s post on the night’s festivities here. SpotStory was a “side dish” at a WebInno event earlier this year. Their idea is to create a place for people to share and collect and comment on points of interest. It made me think of geocaching meets Flickr meets social networking – and all three are things that I enjoy. Until this past weekend the site was in beta. I think I made one or two contributions but didn’t fool around with it much. I logged in on the past Monday to find that they’d taken off the wraps. Since then, I’ve been playing with the site regularly. I’ve added Spots from all over the place. 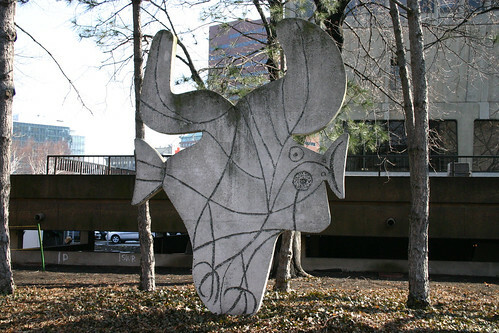 The other day I posted a picture of the Picasso sculpture below of Flickr and someone posted that the same statue stands in Amsterdam – another Spot! And a tour! Today I went through my photos of public art on the MIT campus. That netted out to more Spots and another tour. I’ve also had people post details on places I’ve seen and wondered about. Now as much as I like SpotStory, I’m not quite clear on the business aspect of the site and that may mean this is a short-lived service. But as long as it’s here, I’m happy to be an active part of the community. If you’re into history, art and stories attached to specific places, I suggest you get on and check it out. Wired’s story on the see-through CEO is just great. It lays out exactly what everyone ought to be thinking about – not just in the world of PR but in a general sense. I’ve been writing about the merging of the personal and the professional and the roles of identity, reputation and transparency – but Clive Thompson has laid it out with great examples that show what the future. One can imagine how the twin engines of reputation and transparency will warp every corner of life in years to come, for good and ill.
People can try to ignore this reality – and they’ll be able to for a while; but over time, as access to more and more information becomes commonplace, the willingness to contextually (and by this I mean providing context rather than in certain contexts) share information is going to become critical. Describing what you’ve done, why you did it, how it worked, what you learned and what you’ll do differently in the future makes sense in a world awash in information. People will uncover what you’ve done and how it worked – the opportunity lies in explaining the rationale, the results and the lessons. Being able to do those things well are what will set people and organizations apart. In the PR community there have been questions (and it is alluded to in this article as well) as to the role of PR in the world of social media and transparency. Helping clients consider and communicate the rationale, results and lessons effectively will become increasingly important. These are also not things that many organizations (including most PR firms) are not especially comfortable with. Helping clients navigate this evolution is a key service that communications professionals need to be prepared to provide. David came up with the idea of creating a podcast for the public relations community that would communicate what we’ve learned about the best and worst of PR. Both he and I have been on many panels in front of PR professionals, talking about how to work with the media. The appetite for this kind of information seems to be insatiable, and a podcast is a quick and easy way to capture some of our experiences. The first episode is available here and is worth listening to, check it out. Strike another blow for identity! I read about Citizendium earlier today and was excited to see that they are insisting that all contributors use their real names. Wikipedia’s failure to do this has had two consequences that I can think of – the first is that determining the validity of content relies on the judgment of editors who themselves may not be who they claim. The second is that Wikipedia, in the name of preserving objectivity, has erected rules about who can and cannot be counted as part of the community. Congressional staffers? Out. PR people? Out. But if everyone has to be upfront and honest about who they are, that decreases the likelihood that spurious information will make it onto the site and allow people with knowledge but a perceived agenda (which frankly everyone has to one degree or another) to share what they know. I certainly hope that the Citizendium will truly be worthy of its name and goals and will allow everyone willing to abide by the community standards to be an active and accepted participant in the conversation. What is happening here and elsewhere is important and everyone needs to have a voice – but they also need to be willing to stand behind what they say. Save today’s InfoWorld . . .
More and more publications are going to realize that for some audiences (high tech being just about at the top of the list) this makes much more sense. I’ve spoken to editors at a handful of IDG books over the past several months and most have talked about well the online properties are doing in terms of revenue compared with print. It just makes sense. So save this weeks copy. Not because it’s the last print issue of InfoWorld, but because it represents one of the first publications to take the plunge.